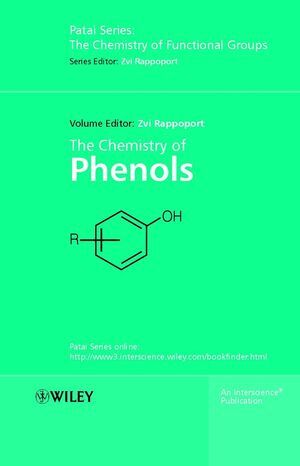 As phenols represent an important functional group category, The Chemistry of Phenols is an essential addition to any chemistry library. Written by experts, all aspects concerning these compounds are covered making this an essential reference book, bringing together invaluable information into one source for organic, organometallic chemists as well as chemists from a variety of other organic sub-disciplines. The Patai Series publishes comprehensive reviews on all aspects of specific functional groups. Each volume contains outstanding surveys on theoretical and computational aspects, NMR, MS, other spectroscopic methods and analytical chemistry, structural aspects, thermochemistry, photochemistry, synthetic approaches and strategies, synthetic uses and applications in chemical and pharmaceutical industries, biological, biochemical and environmental aspects. To date, over 100 volumes have been published in the series. The Chemistry of Phenols as well as the other titles within the Patai Series is also available in electronic format on Wiley InterScience. All new titles will be published online and a growing list of older titles will be added every year. 1. General and theoretical aspects of phenols (Minh Tho Nguyen, Eugene S. Kryachko and Luc G. Vanquickenborne). 2. The structural chemistry of phenols (Menahem Kaftory). 3. Thermochemistry of phenols and related arenols (Suzanne W. Slayden and Joel F. Liebman). 4. Mass spectrometry and gas-phase ion chemistry of phenols (Dietmar Kuck). 5. NMR and IR spectroscopy of phenols (Poul Erik Hansen and Jens Spanget-Larsen). 6. Synthesis of phenols (Concepci´on Gonz´alez and Luis Castedo). 7. UV-visible spectra and photoacidity of phenols, naphthols and pyrenols (Ehud Pines). 8. Hydrogen-bonded complexes of phenols (C. Laurence, M. Berthelot and J. Graton). 9. Electrophilic reactions of phenols (V. Prakash Reddy and G. K. Surya Prakash). 10. Synthetic uses of phenols (Masahiko Yamaguchi). 11. Tautomeric equilibria and rearrangements involving phenols (Sergei M. Lukyanov and Alla V. Koblik). 12. Phenols as antioxidants (L. Ross C. Barclay and Melinda R. Vinqvist). 13. Analytical aspects of phenolic compounds (Jacob Zabicky). 14. Photochemistry of phenols (William M. Horspool). 15. Radiation chemistry of phenols (P. Neta). 16. Transient phenoxyl radicals: Formation and properties in aqueous solutions (S. Steenken and P. Neta). 17. Oxidation of phenols (Shosuke Yamamura). 18. Environmental effects of substituted phenols (Victor Glezer). 20. Polymers based on phenols (D. H. Solomon, G. G. Qiao and M. J. Caulfield).